Introducing herself around campus in 2011, biochemist Sharon Stack sought faculty far outside her academic background. She wanted to get a feel for the breadth of research happening at Notre Dame. Who knew what expertise might be out there that could contribute to the new Harper Cancer Research Institute she had been recruited to direct? One of her meetings, with engineer Hsueh-Chia Chang, suffered a common communication problem: the jargon barrier. Stack asked him what he did. “I do micro/nanofluidics and electrokinetic detection,” Chang said. Stack thought, but didn’t say, “I have no idea what you just said,” instead nodding along while he kept talking. About 15 minutes, as it turned out, until Chang said the magic word. Separation. To a biochemist, that’s a familiar concept, a patch of common ground between Stack and the previously indecipherable engineer across the table. “Do you separate on the basis of size, or charge, or molecular properties?” she asked. To Stack, that sounded like searching for a specific grain of sand in a Lake Michigan beach. And just the kind of capability that might be applicable to her work. “Can you look for microRNA in a blood sample?” she wondered. Now it was Stack’s turn to talk over Chang’s head. She explained that microRNA is a molecule that helps regulate gene expression. And that certain microRNA circulating in the blood could be markers for different types of cancer. By the end of the conversation, although they weren’t exactly speaking the same professional language, they had come to understand how their distinct expertise could complement each other’s research objectives. Stack, studying oral cancer, stumbled upon a potential tool for early detection. Chang, building detection tools, chanced into a possible medical application for his instruments. They have been collaborators ever since. Among the potential procedures they have tested: a method for early-detection of oral cancers related to human papilloma virus (HPV) that could be done in a dentist’s office. Gargle, rinse, spit, and the sample could be tested for the indicators Stack has identified with the tools Chang has developed. Part of Chang’s mission as an engineer is to make smaller, simpler machines that don’t require an advanced degree, or even electricity, to operate. These could extend the complex but essential task of early diagnosis to places that lack preventive medical care and the means to afford it. Chang’s team is engineering a portable, battery-powered machine to test for cervical cancer — “You just push a button and you get a yes or no, basically,” Stack says — that they’re trying to fund for use in Haiti. She has many. 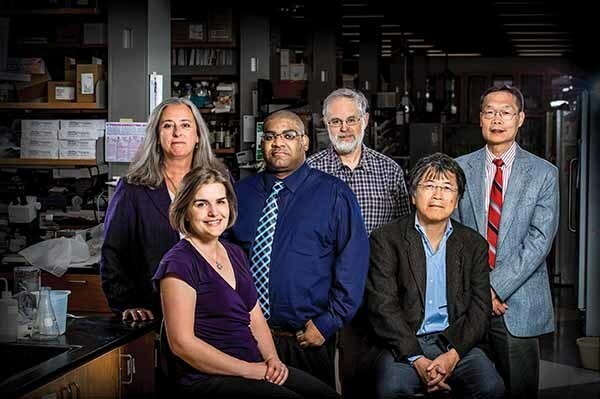 Her Harper Institute colleagues, partners from the Indiana University School of Medicine’s adjacent building, and their collaborators from outside the cancer field are working together to decode the causes and mechanics of numerous types of cancers and the insidious problem of metastasis. Mysteries that can be deciphered only if specialized experts share their intelligence. Stack serves as the impresario, organizing the institute’s research priorities under three broad programs, each led, deliberately, by professors with unrelated knowledge, from biology and chemistry to engineering and mathematics. In that spirit, she has broadened and blurred traditional biomedical boundaries of cancer research, recruiting faculty willing to “feel like an idiot” in conversations that stray beyond their field. Biologist Reginald Hill’s office décor includes a Fantastic Four comic, which he got for himself and three Notre Dame colleagues — Siyuan Zhang, Jenifer Prosperi and Laurie Littlepage — to commemorate them all coming to the Harper Institute in 2012. More than one Harper researcher compares their lab to a startup company, disrupting an industry in need of new thinking and unusual approaches to accelerate discovery. They savor working outside a typical research hospital in an atmosphere that encourages making the acquaintance of strange academic bedfellows, the better to broaden the boundaries of knowledge. Breakthroughs do not await at the bottom of every beaker, however. The work is necessarily intricate and incremental. But the sobering facts — that cancer, for example, will afflict half of men and a third of women in the United States during their lifetimes — adds urgency to the process. Harper researchers not only want to lead the race to an eventual cure but to increase the tempo toward dethroning what Siddhartha Mukherjee, in his Pulitzer Prize-winning history of cancer, called “the emperor of all maladies.” The human cost of cancer, a shadow often cast from personal experience, is never far from their minds. Cancer — just the word, let alone a diagnosis — lands with blunt force. Like thunder, the sound conjures feelings of looming disaster. Associated terms evoke the same heavy dread. Growth. Tumor. Mass. They carry physical and psychological weight. Good news surfaces from time to time. Innovative screening techniques promote early detection, new surgical procedures and better chemo and radiation therapies. Survival rates have improved as medical breakthroughs and technological advances have enhanced treatment. Still, no clinical response compares to cancer’s sudden-strike capability. Identifying the right questions to ask, as opposed to pursuing a predetermined clinical objective, is central to the Harper Institute’s philosophy. The bewildering complexity of how errant cells flourish in the body, and how best to prevent and repel them, remains an immense scientific puzzle. Decades of research has revealed how certain pieces fit together. But the intricacy of the incomplete parts makes it unclear what the finished picture might look like. Harper Institute scientists are interested in that mysterious part of the puzzle and welcome the kind of collaboration essential to solving it. Hill, who studies pancreatic cancer, interviewed with several institutes after his UCLA fellowship before choosing Notre Dame and the Harper Institute in 2012. In words and actions, the biologist found Stack advancing exactly the kind of research environment he wanted. He heard the same buzzwords at each stop, but, while interviewing at Notre Dame, Hill met with potential colleagues and witnessed the fruits of active partnerships. Harper, he says, didn’t just promise a collaborative environment but delivered on it, starting at the top with Stack and filtering throughout the institute. “It’s the trickle-down in terms of that vision,” he says. On his interview tour, Hill visited Chang’s engineering lab. Their conversation lasted into the night. Talk of working together turned into a funded project and a paper that became the cover in Lab on a Chip, a journal that publishes advances in nanoscale research. Pancreatic cancer is rare, but so is survival for those afflicted with it. For most patients, the cancer has spread to other organs before it’s even diagnosed. Chang’s tools for identifying microRNA showed promise for earlier pancreatic cancer detection as well. Hill also works with engineer David Go on another possible method to test blood samples. Exosomes — “imagine like a little bubble inside your blood that contains lots of different DNA, RNA and protein molecules,” Hill says — need to be extracted from the sample to determine whether the markers for pancreatic cancer are present. It’s a time-consuming, labor-intensive process, impossible to perform at a large scale. They brainstormed ways to use Go’s method of applying acoustic waves to isolate the contents of the blood and extract the exosomes to analyze for the pertinent microRNA molecules. Their process has shaved the time required to analyze a single sample from almost 20 hours to about 90 minutes, a major improvement but still requiring more refinement to be viable for clinical diagnosis. Chemist Hummon and mathematician Steven Buechler likewise have combined their expertise to advance the understanding of gene-expression patterns in different parts of the colon. The organ has distinct right and left sides with different genetic expressions. Hummon and Buechler have found patterns that can help predict whether colorectal cancer patients will relapse. Colon cancer has four stages. Patients diagnosed with the first two stages typically do not receive chemotherapy. If they show a gene expression related to a likely relapse, though, they could benefit from an earlier course of treatment. One goal is to develop a clinical test that could be done after early-stage cancer surgery. A doctor could remove a polyp and analyze its gene expression to determine the risk of recurrence, which would inform a decision by the patient about whether to undergo chemotherapy. Hummon studies the tissue samples. Buechler crunches the numbers. Without one capability or the other, the progress they have made as complementary partners would be impossible. Siyuan Zhang, a man of many instructive metaphors, helps explain the multifaceted state of the art in imaging technology. Zhang’s lab studies metastasis, the spread of cancer from its primary source to other organs, and the “microenvironment” in which the cells flourish. Once a cancer has metastasized — from the breast, lung or skin, for example, to the brain — the prognosis is dire. The migrating cancer cells adapt to the surrounding brain tissue through genetic changes that help the invaders thrive in their new environment. Communication between the malignant, relocated cells and the surrounding brain tissue produces a mutually beneficial environment conducive to the deadly spread of disease. Zhang wants to understand the nature of that cellular transformation. He’s a cell biologist, so he wants to see what he’s studying. A common approach is to perform DNA and RNA sequencing on the entire brain, which does not yield the single-cell level. “If you’re sequencing the brain as a whole it’s almost like — what do you get? — it’s a smoothie,” Zhang says. In a smoothie, pinkish or bluish hues might be identifiable, but it would be very difficult to tease out from a blended whole the precise impact of or interaction between, say, strawberry and blueberry cells. “Subtle but maybe critical changes will be overshadowed,” he says, perhaps obscuring information about cellular interaction that could help illuminate the nature of the microenvironment. In an organ as complex as the brain, the advantages of single-cell analysis are complicated by the sheer volume to be examined. Danny Chen has that capability. He’s a computational engineer with a particular interest in providing statistical analysis for medical imaging. Chen has developed coding to analyze the size, shape and location of a tumor in three dimensions, helping Zhang perform more targeted eavesdropping on what he calls the “crosstalk” between relocated cancer cells and the brain tissue that harbors them. With that information, other researchers such as Harper organic chemist Brandon Ashfeld and chemical engineer Jeremiah Zartman can develop and test potential therapeutic methods to sever the connection. Even the people involved can’t say with certainty where many Harper projects will lead. Identifying the right questions to ask, as opposed to pursuing a predetermined clinical objective, is central to the Harper Institute’s philosophy. Stack often brings up research from the 1960s into what organisms survive in boiling water. Such basic science, she points out, became the basis of Nobel Prize-winning research decades later that revolutionized the kind of DNA testing now common in diagnostics and forensics. That wouldn’t have been possible, Stack says, without the foundation the earlier work established, a model she hopes her researchers can replicate for translating basic questions into groundbreaking results. Harper Institute scientists seem to thrive on unpredictability. Zhang, who came to Notre Dame from the University of Texas MD Anderson Cancer Center, recalls the “chalk talk” he presented while interviewing, outlining his plans for the next three years. “When I look back, I’m doing none of those,” he says. Instead, he seized the opportunity that only Stack’s vision and Harper’s structure offered him, to develop innovative partnerships that spark new approaches to cancer research, taking greater risks with more potential to produce revolutionary results. They’re trying to reach farther and higher, into uncertain terrain, but with confidence that their collective approach can decode causes and discover treatments that otherwise would not be found. Originally published by Jason Kelly ’95 at magazine.nd.edu on July 06, 2016.